How to create dashboards and widgets to visualize and understand sensor data of an IoT Solution. Dashboards (static and dynamic) are user interfaces to organize and present a device's data and the insights derived from the data. Dashboards contain widgets that display the data as charts, indicators, controls, tables, graphs, and other size, shapes, and forms. 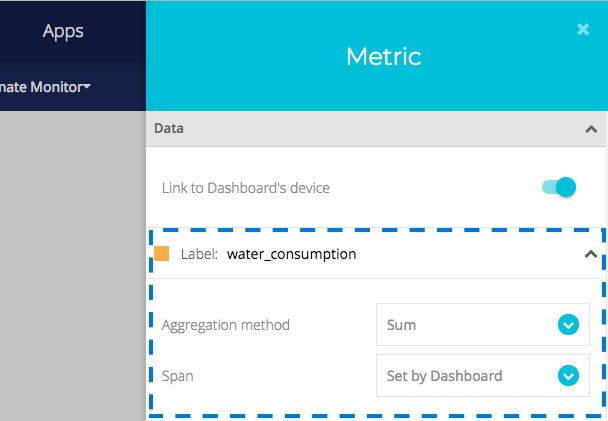 With Ubidots, you can create Static and Dynamic dashboards. Static Dashboards are used to visualize data from predetermined devices and variables. Static dashboards display the same device and variable data at all times. 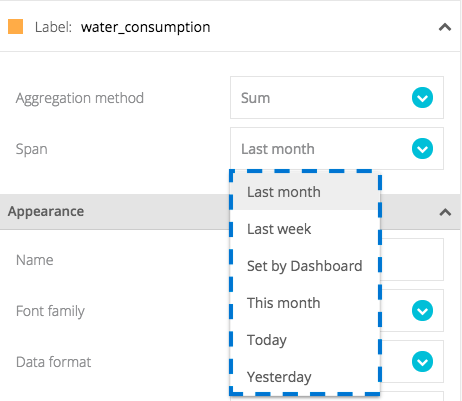 Dynamic Dashboards utilize a primary and replica (master/slave) technology to visualize data from different devices and variables, using a dropdown menu in the settings bar. By selecting different devices from the settings bar, a dynamic dashboard will refresh with the underlying device and variables populating each widget's visualization according to the device selected. When a device is selected from the setting bar, then all variables within each widget will automatically update to reflect the device’s variables. This is achieved because dynamic dashboard widgets are not associated with predetermined variables; instead, they are associated with variable labels (i.e. label=temperature). Ubidots allows you to combine static and dynamic widgets at will. Using our Truck Application example, imagine you have a variable with the aggregated fuel consumption across all thousand trucks. You want this variable to be displayed in every truck’s dynamic dashboard, regardless of the selected truck. In this case you would create a static widget pointing to a preset variable. 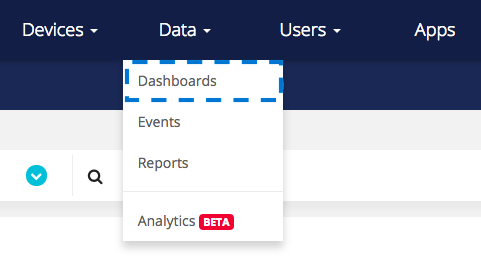 Step 1: To create a dynamic dashboard, go to "Data" –> "Dashboards"
Default time range: The default time range when the dashboard is loaded. Dynamic Dashboard: Leave enabled if you're creating a dynamic dashboard. Disable it if creating a static dashboard. Resolution: Choose a resolution according to the screen used to display the dashboard, or leave as Auto to be responsive. Date format: Select the general date time format so the widgets inherit it. If "Custom date" is select, refer to the IMPORTANT NOTE below. 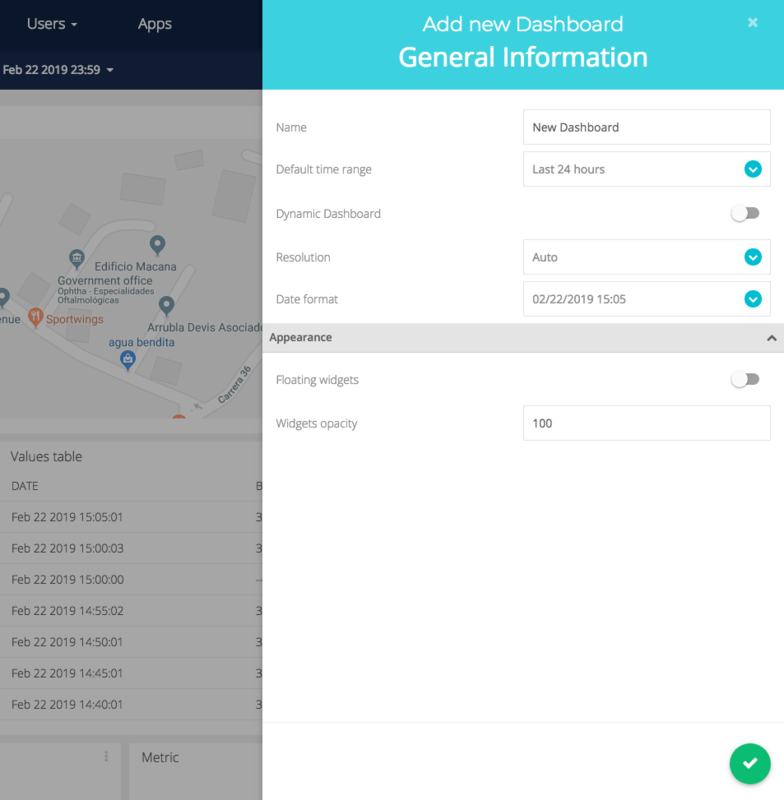 Default device: If dynamic dashboard is enabled, then select the default device for each time the dashboard is displayed. Floating Widgets: Leave as Disabled if you want widgets to snap to each other. Enable if you want to have widgets "floating" in the user interface. Widgets Opacity: Change the opacity of the widgets to give further clarity to a dashboard; "0" is transparent, "100" is solid white background. IMPORTANT NOTE: Customizing your Date format. – "D/MMM/YY H:m:ss.SSS" – "22/Feb/19 14:57:40.369"
– "YYYY-MM-DD hh:mm:ss A" – "2019-02-22 03:01:08 PM"
Notice that non alphanumeric characters such as "/", ":" or "–" are parse literally to the resulting Date format. Finally, click on the green icon in the lower right of your screen to save the configuration and create a new dashboard. Step 1: To create a static widget, click on the “+” icon in the top-right corner of the dashboard user interface. Step 2: Select the type of Widget from the available options, or create your own with the HTML Canvas. Step 4: Assign Variable for the widget by selecting "+ Add Variables"
Every widget has a different set of configuration options. Depending on the widget you might be able to add one or several variables. For instance the metric widget only supports one variable, while the line chart widget supports multiple variables. This option allows you to apply an aggregation method (average, count, last value, max, min or sum) over the time range set in the dashboard's settings bar. The widget will automatically sum all values within the time range specified in the dashboard's settings bar. The following widgets have an option to apply a method of aggregation. Name: The text label to appear in the upper left corner of your widget. Date Format: Choose between different date formats. 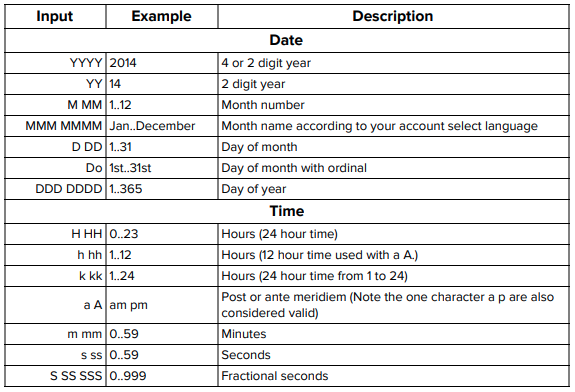 If "Custom date" format is selected, same rules apply as in Dashboard settings in section 3. Color: Every widget has a default color ("Set by widget" option), picked by our designers. You can override this default color by selecting the option "Variable's default", which will use the variable's color.